How nice it is to find an American envelope in the mail box! I was expecting this mail for three weeks! It is a gift from my blogger friend Diane from Butterfly Threads Quilting. 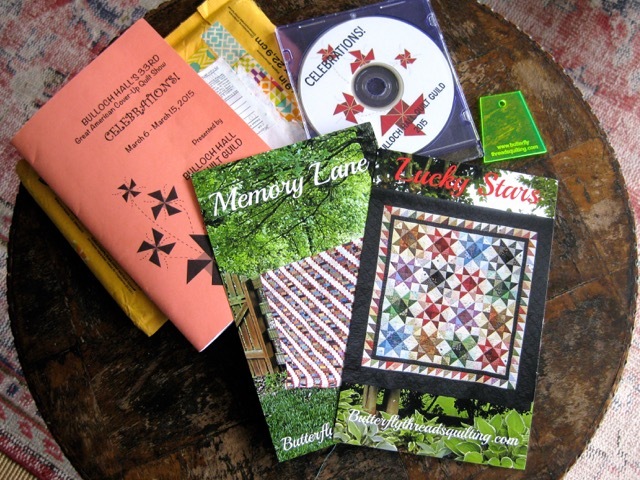 Last month, when I read this post in her blog and expressed my regret not to live in USA and thus not to be able to visit the Bullock Hall Quilt Show that she was attending, she had the sweet thought to send me the catalogue and the DVD of the exhibition. And what a lovely surprise to find that she added some presents in the envelope : two quilt patterns and a template of hers! The pattern explanations are written behind the cards and are so clear and easy to understand. Thank you so much Diane! The second picture shows another surprising event when I opened the shutter of the lounge this morning : snow... at this time of the year!! Here in Greece, we celebrate the Orthodox Easter next Sunday... under the snow??? Quels merveilleux cadeaux....Diane a le cœur sur la main et grâce à toi, je suis à présent son blog !! Such strange weather this year!! And what wonderful happy mail...enjoy! How thoughtful!! What a lovely surprise for you...and so is the snow!! YIKES! How thoughtful of Diane and what a lovely package of gifts. It must be amazing to have snow at this time of the year and that is a great photo. Enjoy your Easter next Sunday. Que de surprises !! de belles, de moins bonnes mais je suis sure que tu te seras focalisee sur les bonnes ayant trait a ton passe-temps favori...isn't it ??? What a lovely surprise in the mail.........I would love to wake up to a surprise snowfall too, but I'm guessing you are ready for Spring. Two surprises! Good for you, Christine. Maybe you can save some the snow - it's going to be a long hot summer very soon. Diane certainly sent you some wonderful gifts! Snow! That is a surprise! What fun to get happy mail from your friend Diane! 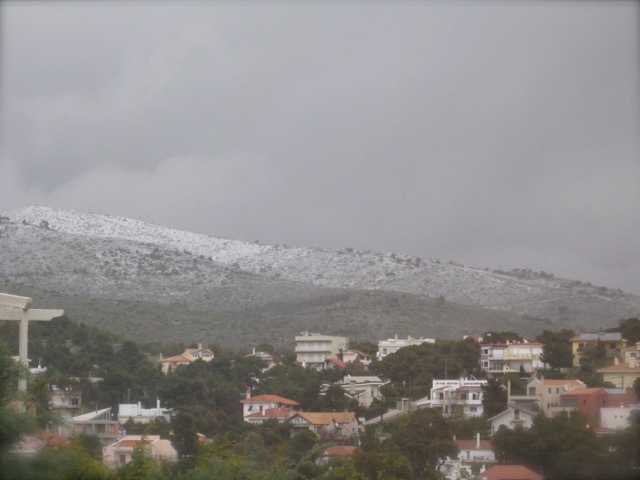 Christine, do you remember how many of us were surprised that you get snow in Greece? Well it is even more surprising to see you getting it in Springtime! Quels beaux ouvrages en perspective... ces étoiles sont fabuleuses! Snow at Easter? Well, we had a rare white Easter too, here in Toronto. But you must be very high up to be getting snow where you are. I hope it warmed up later!